This month its about colour.....beautiful Burnt Orange mixed with some natural Shetland wool yarn for contrast. To enter you need to vote for your favourite colour combination from the two choices here; Shetland Halo yarn in Burnt Orange, with Burnt orange Angora/Qiviut yarn & Natural Moorit. Yarns as above with a contrast yarn of Natural Black Shetland wool. I opted for the Moorit combination to knit my cowl. The Angora/qiviut yarn & Shetland wool were dyed in the same pot, see the difference in shade how grey qiviut & Grey Angora rabbit fibre produce a much darker shade than the natural grey shetland wool ! To enlarge any picture to see detail click on it ! If you are allergic to Angora rabbit fibre then you better give this months giveaway a mis. The Qiviut blend yarn is 50% Qiviut & 50% Angora rabbit.....makes wonderful soft knitwear with a distinctive halo, softer than Cashmere & warmer than Cashmere ! I want to knit a simple soft cowl in bright colours with Texture, knit circular with a Picot edge top & bottom & brick stitch design. Simple easy knitting while watching TV. The Picot edge will have to be knit in the shetland wool to show up as the angora/qiviut yarn will produce too much Halo, the picoty edge will be lost. Because i will be using purl sts & changing colours all the purl bumps will show the contrast colour & add more texture & depth to the cowl. 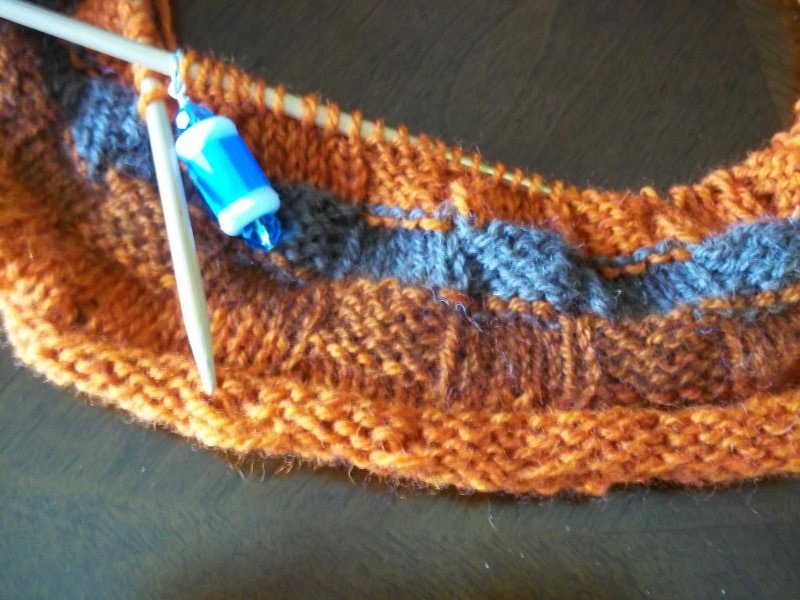 With Shetland Halo yarn-Burnt Orange cast on 130 sts, join to work in the rnd, add 1 stitch marker & knit 6 rnds. RND 7: Make Picot edge. *k1, yo, k2tog-rep to end of rnd. RND's 8-13 knit all sts-Picot edge complete. RNDS 1 TO 5: slip marker, k5, p5, rep to end. RNDS 6 TO 10: slip marker, p5, k5, rep to end. 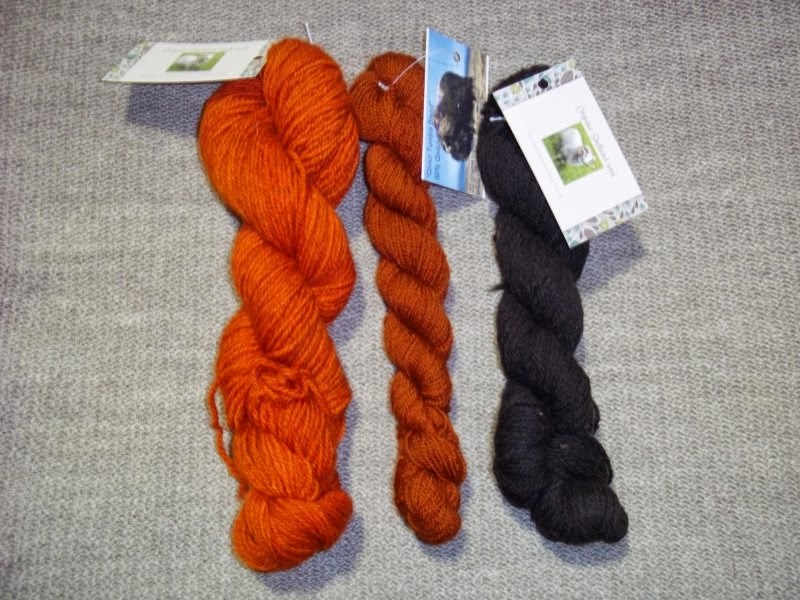 RNDS 11 TO 15: Change to Burnt Orange shetland yarn & as before k5, p5 . Rep from * until work measures 11.5'' inches. Ending with Burnt orange Angora Qiviut yarn then with the Burnt orange shetland yarn make picot edge as before. 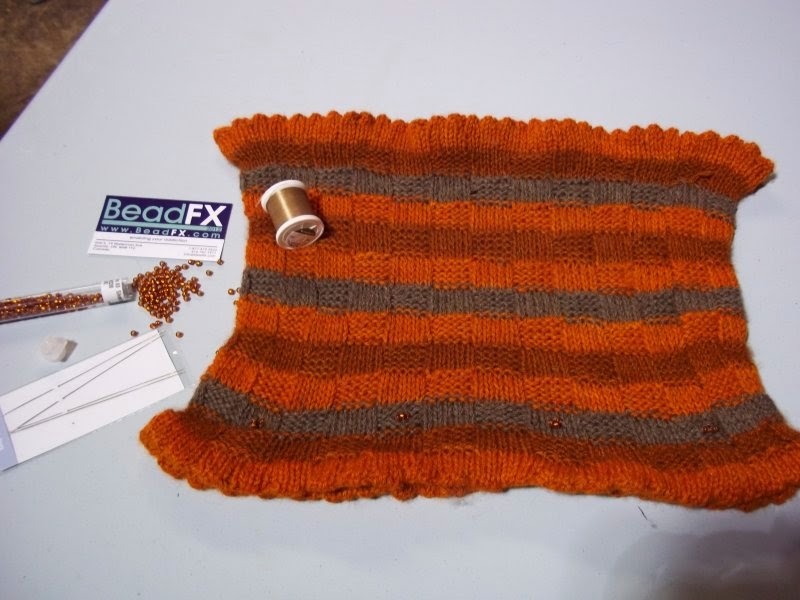 I decided to add some orange beads every third square to the Natural wool. I will include some beads for whoever wins the yarns. I'm quite pleased how it turned out. It is long & wide enough to cover the head & most of the neck. When worn puddled around the neck it is wide enough to lay on the shoulders.... has a nice drape to it & is quite soft. To enter this months giveaway simply tell me what natural contrast shade you would prefer. December giveaway free knitting pattern giveaway winner shetalnd yarn shetland halo yarn. shetland wool cowl. Labels: December giveaway free knitting pattern giveaway winner shetalnd yarn shetland halo yarn. shetland wool cowl. This will be a very nice cowl, I think I got a soft spot for the moorit... so I'm picking the first picture. The colors you have used are wonderful ... love them. I would love to have the Moorit combination. I love the burnt orange colours. Isn't it fabulous that something as simple as changing the fiber base can transform a colour? Hmm. 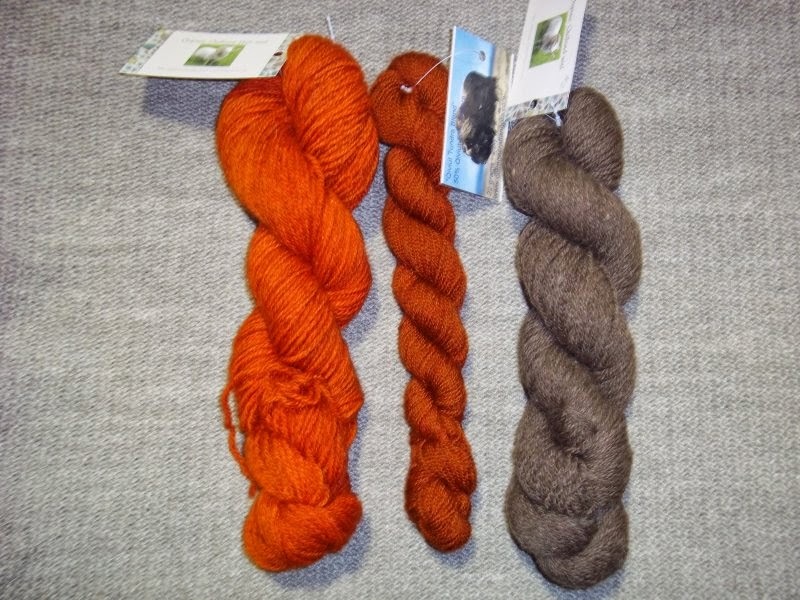 Looking at the skeins, I would have chosen the Moorit as the contrast color. But looking at your progress so far, I think I might actually like the Black. This color combination would also look cool in a slip stitch pattern - both the dark over the light and the light over the dark. Brilliant burnt orange, by the way. It turned out beautifully and it's so interesting how the different fibers turn out differently. My choice would be the first combinati9on, with the natural brown. I think it would blend better with the colors you've already knitted. Black would stand out too starkly. Unless you prefer it that way. Moorit for sure. Black is too hard to knit with in the long dark winters. I would go with the Moorit as well, it looks like a lovely cowl so far! I like the combination of the Moorit with the beautiful burnt orange. Love the Moorit combination, soft winter shades that goes well together. I love them both. For something different I would go with the Shetland black. I just clicked through from Shine's blog when I saw Shetland sheep in the title. I am following, and would love to enter your giveaway! I like the Moorit combination. Beautiful colors! I love the combination of moorit with burnt orange. Looking forward to seeing the rest of your cowl!